In the pink, dawn light of the Texas morning, headlights crisscross pavement still warm from yesterday’s sun. Even this early in June, North Richland Hills will see sweltering temperatures later in the day, yet the faithful still stream onto the parking lot, eager to find the best available spot and join the pioneering tribe that forms the foundation of a new community. Coolers are being untied from roof racks. Two teenage boys are ignoring a sheet of instructions on how to set up their now-misshapen tent. Beyond them, a beanbag lands with a thud, missing the circular target of the players’ yard game by a few inches. The energy defies the hour as new arrivals sign their names to one of just 100 lines on a sign-in sheet that will be full within an hour or two. Before their second shared sunrise, bright lights will shine, the doors will swing open, and fresh, smiling faces will hand each reveler the prize for which they have come: free bird. Chris and Kate Driscoll aren’t interested in southern rock anthems, at least not this morning. 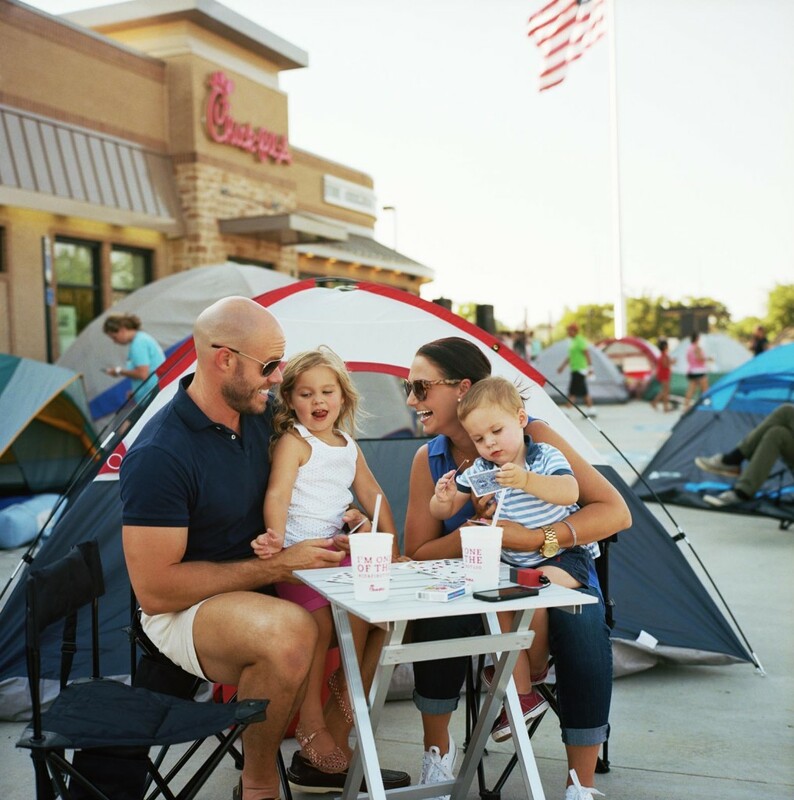 They, along with their young children Chloe and Greyson, are camping out overnight at the latest First 100 event to celebrate the opening of local franchise owner T.J. St. Romain’s new Chick-fil-A restaurant just north of Fort Worth, Texas. For diving into the deep end of the opening festivities, they’re now one of the first 100 people that will dine at the restaurant, receive free chicken sandwich meals for one year and form new friendships that will last many more. For the Driscolls, the new restaurant has already become a pillar of their community. 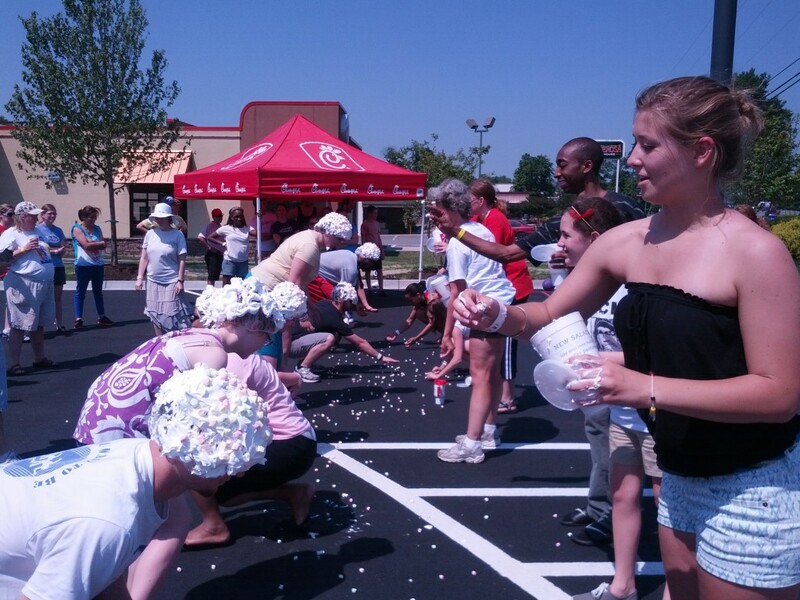 With surprises like free lunch and make-your-own Icedream sundaes for the campers, games organized by the staff, and plush Chick-fil-A cows for the kids, St. Romain’s team laid out a huge welcome mat for their guests. “They considered everyone; it was a truly joyful experience,” Chris said. These events, now in their 12th year, draw folks from all walks of life: young and old, students, professionals, families and anyone else willing to forge new friendships, sleep under the stars, and partake in a celebration of community. “There’s no better way to open a restaurant than to first spend a little time getting to know some of your customers. Our local restaurant owners tell us over and over how much they love connecting with more than 100 people in their local communities. It’s really become more than just an event – it’s a tradition that brings people together,” shared Matt Reed, who works on the new restaurant marketing team at Chick-fil-A. That tradition, which was started by eager tent-pitching customers and later hosted by Chick-fil-A, has resulted in more than 4 million free meals given away since 2003. Dr. Jonathan White, Professor of American Studies at Christopher Newport University (CNU) in Newport News, Virginia, appreciated the tangible benefit of First 100 events as much as he did the fun and games. “When I was living off a $14,000/year income in graduate school, I learned about Chick-fil-A First 100s and got hooked,” Dr. White says. With a Chick-fil-A on the campus of his graduate school, coupons for free meals went a long way. “I can easily say that Chick-fil-A First 100 kept me from going to bed hungry at night.” Now years later, Dr. White occasionally conducts classes at the Chick-fil-A restaurant across the street from CNU, and went so far as to include an acknowledgement of its local franchise owner, Sean McClure, in his most recent book on civil war history. The two have become pals, which really, is what these events are all about: connecting a restaurant and its community. And some free chicken doesn’t hurt either.